» Del 13C and del 15N ratios in a peat core at 2 cm depth intervals at 4 locations along the Dalton Highway, North Slope Alaska, 1989. Peat cores, approximately 15 cm2, were collected with a gasoline engine-driven SIPRE corer and long bladed nursery shovels. These were stored in plastic bags and refridgerated until processing. The core was divided into three sections , one to be used for radiocarbon age, one for loss on ignition and del C-13, and the remainder to be kept for future needs. The sections were further divided into intervals of 2 cm for determination of the desired parameters. For isotopic analysis 20 to 60 mg of peat was ground with 1.1 to 1.5 g of CuO per 30 mg of sample in a Wig-L-Bug dental amalgam mixer. The CuO sample mixture was then placed in a 5 cm by 6 mm quartz tube and inserted into a 30 cm by 9 mm quartz tube. To obtain sufficient quantities of nitrogen gas for anlaysis, 2 to 3 such tubes were processed for each sample. Tubes with samples were then dried for an additional 12 hours at 70 degrees C, evacuated wot &lt; 1mTorr on a vacuum manifold and sealed with an oxygen-gas torch. The evacuated tubes were combusted in a muffle furnace at 870 degrees C for one hour and allowed to cool slowly for at least 12 hours. Gases liberated by combustrion were separated and collected by cryogenic distillation on a vacuum manifold using the procedures described by Handley et al (1991). Briefely the sample were introduced into an evacuated line with a stainless steel tube cracker (Des Marais and Hayes, 1976). Carbon dioxide and water vapour were isolated by a liquid nitrogen cooled distilation loop and the remaining nitrogen was cleansed of any trace CO2 and H2O vapours by passage through a second liquid nitrogen cooled loop. N2 gas was compressed into a 15 cm by 6 mm borosilicate glass tube and sealed off with an oxygen-gas torch. Temperature of the CO2 trap was raised to about -80 deg. C and the CO2 sublimed from the trap. the CO2 was collected in glass tubes cooled with liquid N2 and sealed with a torch. Isotopic ratios of collected gasses were measured on a VG Isogas Sira-9 or a VG Series II dual inlet mass spectrometer. Please see file "1989_SoilCoreProperties" for Bulk density, percent organic carbon, moisture and other soil core properties. Barnett, Bruce Alan, 1994. Carbon and Nitrogen Isotope Ratios of Caribou tissues, vascular plants and Lichens from Northern Alaska. 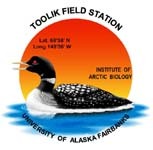 Masters Thesis, University of Alaska, Fairbanks, School of Fisheries and Ocean Sciences. Supervisor Don Schell, Aug 3, 1994. Schell, D.M., Barnett, B. 1993. Carbon dynamics in arctic Alaskan tundra. In: Landscape Function: Implications for ecosystem response to disturbance, a case study in arctic tundra. Reynolds, J.F., Tenhunen, J.D. eds., Springer-Verlag. Handley, L.L, Scrigeour, C.M. Thornton, S.F., Sprent, J.I. 1991. Determination of the natural abundances of the stable isotopes of N-15 and 13C by mass spectrometry: A simplified manual method for the preparation of N2 and CO2. Functional Ecology, 5:119-124. Happy Valley: Riparian site near Happy Valley,Dalton Highway, Alaska, U.S.A. 69 degrees 09' 04' N, 148 degrees 50' 06" W.
Oliktok Dock Road: Coastal Plain site 0.5 mile north of drill 1Q on Oliktok Dock Road, Spine Road, Prudhoe Bay, Alaska, U.S.A. 70 degrees 22' 19" N, 149 degrees 47' 10" W.
Version 3: Updated to newer metadata form (with sites sheet). Fixed discrepency with variable names. CH March 2013.